Departing from St. Petersburg on May 28, 2020, prices starting at $5,999. 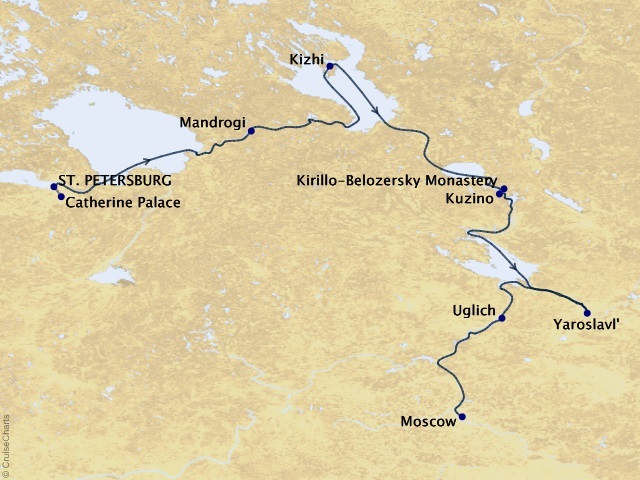 Take an unforgettable journey and discover Russia's treasures on Viking Helgi. 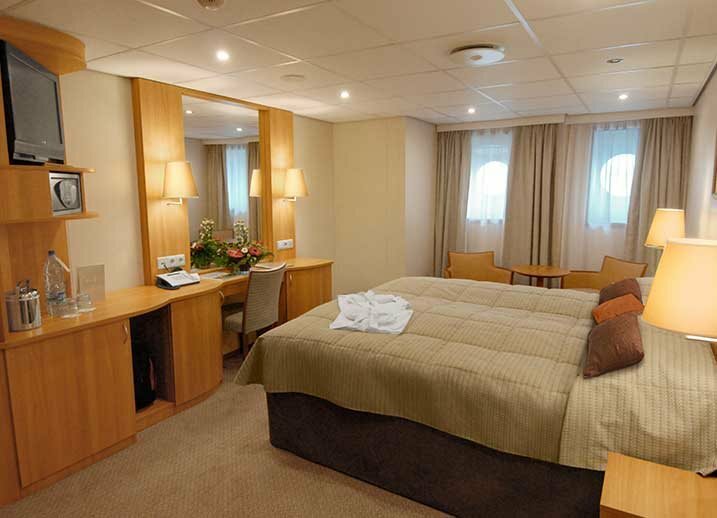 Recently refurbished, this ship carries 210 guests, and offers two 400-square-foot suites and 104 spacious staterooms, with upper and middle deck staterooms boasting private verandas. All accommodations are comfortable and elegant, complete with hotel-style beds and amenities like 26-inch flat-panel TVs and in-room refrigerators. Expanded restaurant facilities and beautiful public areas help make Viking Helgi one of the finest river cruise ships in Russia. 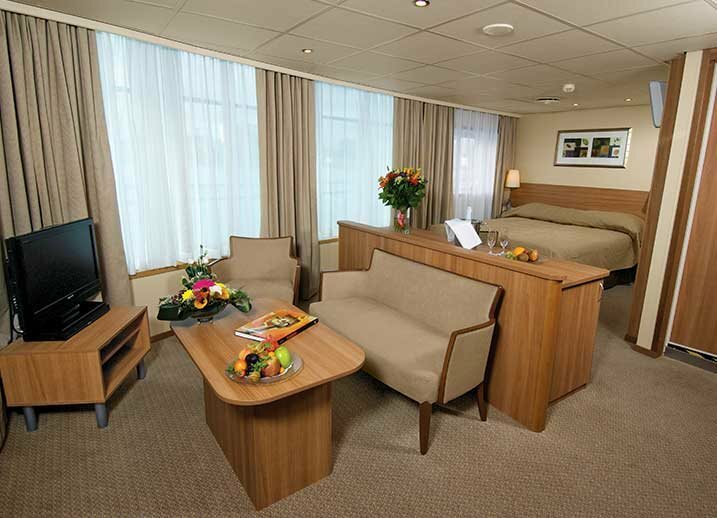 Roomy and comfortable; Located at the heart of the main deck, separated from public areas, convenient to the onboard boutique and the library; Private bathroom with shower and premium bath products; Space under bed for storing suitcases; Roomy wardrobe with wooden hangers; Large picture window 4.10 ft. x 2.79 ft. (can be opened); 26-inch Sony flat-panel TV with premium entertainment package including CNN and other English-language programming; Refrigerator; Hair dryer; Safe; Telephone; Bathrobe and slippers available upon request; Air conditioning; Voltage: 220V and 110V in stateroom; Bottled water replenished daily; 140 sq.ft. Hotel-style beds 79 inches x 63 inches (with optional twin-bed configuration); Private bathroom with shower and premium bath products; Space under bed for storing suitcases; Roomy wardrobe with wooden hangers; Large picture window 4.10 ft. x 2.79 ft. (can be opened); 26-inch Sony flat-panel TV with premium entertainment package including CNN and other English-language programming; Refrigerator; Hair dryer; Safe; Telephone; Bathrobe and slippers available upon request; Air conditioning; Voltage: 220V and 110V in stateroom; Bottled water replenished daily; 160 sq.ft. Hotel-style beds 79 inches x 63 inches (with optional twin-bed configuration); Private bathroom with shower and premium bath products; Space under bed for storing suitcases; Roomy wardrobe with wooden hangers; Floor-to-ceiling sliding glass doors open onto a private veranda; 26-inch Sony flat-panel TV with premium entertainment package including CNN and other English-language programming; Refrigerator; Hair dryer; Safe; Telephone; Bathrobe and slippers available upon request; Air conditioning; Voltage: 220V and 110V in stateroom; Bottled water replenished daily; 230 sq.ft. 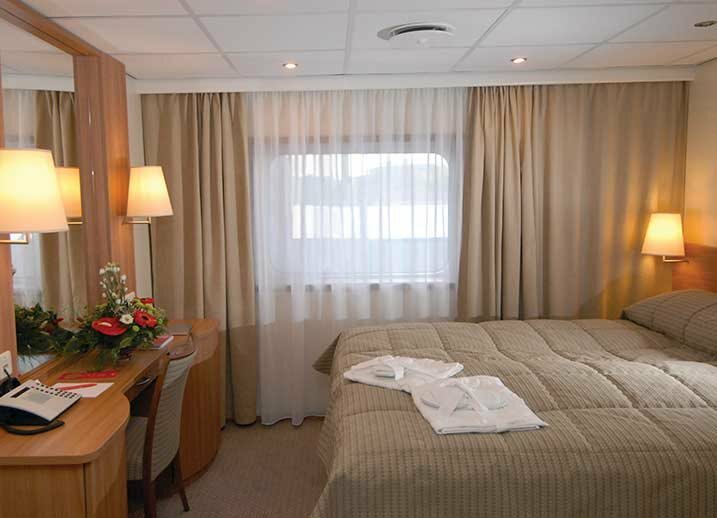 Deluxe suites; The utmost in luxury, privacy, space, and stunning views; Located at the fore of the middle deck; Hotel-style beds 79 inches x 63 inches (with optional twin-bed configuration); Floor-to-ceiling sliding glass doors open onto a large veranda along both sleeping and living quarters; Large private bathroom with shower, bathtub, and premium bath products; Space under bed for storing suitcases; Roomy wardrobe with wooden hangers; Panoramic windows; Two flat-panel TVs; 26-inch Sony flat-panel TV with premium entertainment package including CNN and other English-language programming; Refrigerator; Hair dryer; Safe; Telephone; Bathrobe and slippers available upon request; Air conditioning; Voltage: 220V and 110V in stateroom; Bottled water replenished daily; 400 sq.ft.